The DNR Division of Entomology & Plant Pathology has discovered that a shipment of boxwood plants infected with boxwood blight was shipped to Indiana in May. The black streaks on these stems are typical of boxwood blight. Photo by M. Daughtrey, New York. 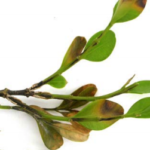 This is important because boxwood blight (Calonectria pseudonaviculata) is a fungal disease that infests members of the popular Buxaceae family, and is often transported through the nursery trade. Hosts include Buxus (boxwood), Pachysandra (Japanese spurge) and Sarcococca (sweetbox). In total, 23 stores in Indiana received infected material in early spring (particularly “Graham Blandy” cultivar), and it’s possible that members of the public inadvertently purchased some plants. The fungus, which can lay dormant in drier conditions, can be found on all above-ground portions of the plant and presents itself as dark leaf spots. It causes rapid defoliation, which typically starts on the bottom of the plant and moves toward the top. This fungal pathogen can move through sporulation in water and from dropped leaves. As a result, infection can spread to surrounding plants from a single infected plant. If you suspect one of your plants shows signs and symptoms of boxwood blight, please call (866) NO EXOTIC (866-663-9684) use the information at dnr.IN.gov/entomolo. A DNR inspector found the plants at a national chain home and garden store in early October. The shipment originated at a nursery in Oregon. It was also sent to stores in 11 other states. Upon confirmation of boxwood blight on these plants by the Purdue Plant and Pest Diagnostic Lab, the DNR required that the chain remove all boxwood from their shelves for disposal and that the stores mitigate the area through disinfection to ensure that the pathogen is no longer present and able to infect further shipments of plants. 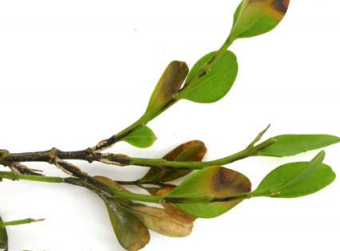 The DNR is currently surveying for boxwood blight in Indiana. To date, the DNR has not found the pathogen, except for a few interceptions like this one.